My front driver’s side bay has a Thomas air compressor...that I’m wondering how to utilize for purposes other than it’s primary purpose...leveling, right? Above and to the left side inside the bay is a female air hose fitting coming out of the side wall. No levers, dials, gauges, etc. just the fitting. 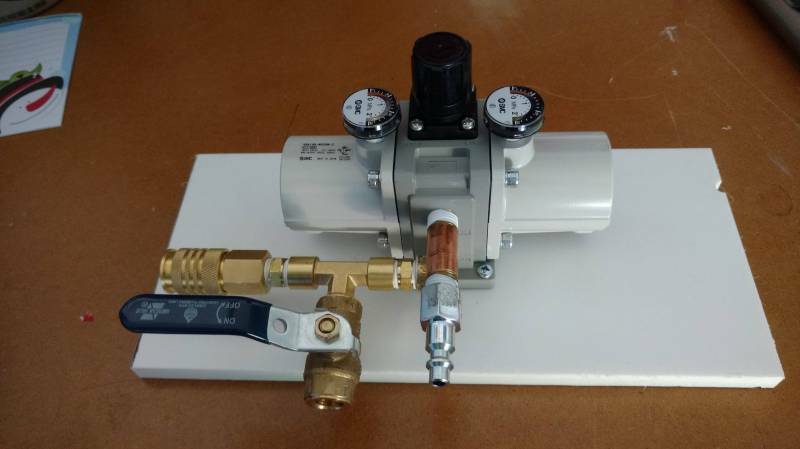 So, how can I use the air compressor? I finally got a hose hooked up and quickly the air bled off and the compressor did not come on. Bummer. Some folks speak highly of the Viar compressors. I grew tired of hauling a 110V pancake style air compressor for inflating tires, etc. and got an air doubler. I plug it into the same fitting you see in that compartment and I can produce up to 200 psi if I need to. It will easily inflate my tires and anything else that needs air. Now it will only work as long as you still have residual air in your coach air system. I have rarely had to run the engine to get enough pressure when I use this thing. My rig has one in the front driver side basement and in the engine hatch. I can inflate my tires to about 105 psi using the onboard system. A tow truck can use these connectors for managing your brake and leveling system from the tow vehicle. That Thomas compressor doesn't have the capacity to inflate a 22" tire. Look under the coach on the driver's side and you should find 3 valves. One of them can be used to tap nto system air to inflate tires. I just found the drain valve for the coach's wet tank (in the basement under the drivers seat) and screwed in the air chuck. The threads were even correct. What model doubler did you use? Been thinking about getting one. SMC VBA10N. It's at the coach in storage so that is my best recollection. Thanks so much for the excellent feedback and help...and smlranger for that “doubler”. But, I have only one fitting in my bay below the driver’s seat...and not sure where to go from here. I’ve attached pics from 3 angles of that bay. So that fitting is used to drain water from the air tank? No, you use the valves under the front of the coach on the driver's side. I have a Thomas compressor on my gasser. It is used for the supplemental air brake for my toad.